My first trip to MtOlympusPark.com Water and Theme Park came this year in early August. We had heard great things about Mt Olympus since it was transformed from Family Land into the mega park that it is today. We knew that most of the rides opened up at 10 am, so my girlfriend and I decided we would arrive around then. We entered the parking lot through the main entrance, and didn’t have any trouble finding a parking spot close to the main gate. We had our tickets in hand, which meant we wouldn’t have to stand in line to buy then. However, the lines at the ticket gates were still short when we got there, most likely because we visited on a weekday. We had a plan to start off the day at MtOlympusPark.com with the roller coasters at the outdoor theme park called Zeus Playground. First off, the roller coasters seem to be the biggest attractions there, so we wanted to experience them before the lines got too long. Secondly, the temperature was 75 degrees when we arrived, and we felt it would be best to wait until mid-day and the projected 82 degree high before we hit the water rides. But before the roller coasters, we had to find the lockers. We only brought in towels, car keys, money, and sandals, but a locker was a necessity. After walking past all the dry rides and through the majority of the park, we found the lockers right next to the Parthenon Indoor Theme Park. Later in the day, we found more lockers when at Neptune’s Outdoor Waterpark, so there are a couple of options there. We put away our towels, keys, and money but kept our sandals on as you are required to wear them on any dry ride at MtOlympusPark.com Water and Theme Park. We then made our way to the first of the three main roller coasters, Cyclops. Walking up to the ride, we noticed that just like most of the roller coasters at MtOlympusPark.com, Cyclops is made almost entirely out of wood. While this may scare some, don’t worry…we came out just fine. In fact, about 20 feet into the ride, the first 75 foot drop marked a good start to the day…and it definitely woke me up. We then made our way to Zeus, which was a bit faster than Cyclops and a good warm-up for what was to come. The line was a bit longer at Zeus than it was at Cyclops, so be prepared to wait 10-20 minutes. Then it was time to experience Hades, and the towering drop that is impossible to go unnoticed no matter where you are at MtOlympusPark.com. Hades was voted Best New Ride by Amusement Today in 2005 and received the 2005 Golden Ticket Award for Best New Ride by The Travel Channel…and I can see why. The first drop of 140 feet seems like nothing compared to the 65 degree 160 foot drop that sends you underground and unable to see a thing. If you like roller coasters and want some excitement, Hades will be your favorite ride at MtOlympusPark.com Water and Theme Park. After catching our breath and coming down from the rush, we decided to check out some of the other dry rides. With 9 go-kart tracks to choose from at MtOlympusPark.com, we weren’t quite sure which one to choose. We decided to try the Trojan Horse, mainly because it looked the coolest. The Trojan Horse is 3 stories tall and brings you around and around the famous landmark. The karts don’t go all to fast so it’s not dangerous at all. We later found out that there is an underwater go-cart track, Poseidon, which sounds extremely amazing and fun. All in all, I really don’t think it matters too much which track you choose as MtOlympusPark.com Water and Theme Park was voted the BEST place to go for go-karts by the Travel Channel. Basically, if you like go-karts, any one of the nine should do the trick. We finished up the dry rides at the Pegasus, another roller coaster. This one was not as fast and long as the 3 mentioned above, so it’s perfect for those who aren’t crazy about roller coasters or those with smaller children. It’s no sleeper though, so don’t get too comfortable. By the time we finished up with Pegasus, we were both getting a bit hungry. We made our way back to the locker, got some money, and looked at the map for options. 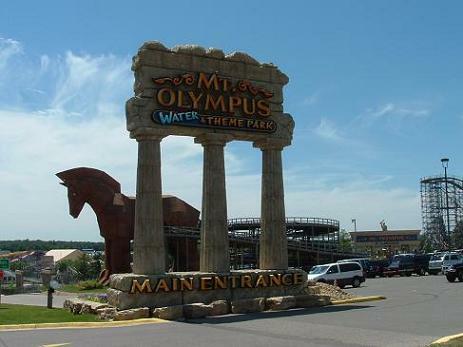 There are so many places to eat at Mt Olympus Wisconsin Dells including Kaffe Opa, Latte Goddess, Medusa Café, Tidal Wave Concession Stand, Mythos Grill, Pandora’s Candy, b>Tiki Bar, Big Fat Greek Pizza Joint, Greek Tycoon, Gladiators Bar and Grill, and Cafe' Opa. We decided to get something quick and both got chicken tender baskets at the Greek Tycoon. It was actually quite good for being inside Mt Olympus Wisconsin Dells, and the price wasn’t too bad. After lunch, it was time to hit up the water fun at Neptune’s Outdoor Waterpark. We came upon Triton, located right next to The Parthenon. By the way, for everyone who is bringing children to MtOlympusPark.com Water and Theme Park (which I’m guessing is the majority), be sure to spend some time in The Parthenon. Just outside The Parthenon is the Disco, which spins back and forth and rotates around and around. We then took a peak inside and saw The OPA roller coaster, Bumper Cars, The Spring Ride, The Tea Cups, and The Crazy Trolley. All of the rides are perfect for kids, and it seemed like this was the “kid hangout.” However, still note that there is a height limit on some of the rides. Back to Triton. Triton consists of three different 5-story water rides, Triton’s Fury, Triton’s Rage, and Triton’s Challenge. Needless to say, we tried them all. They are all family friendly rides. Triton’s Fury and Triton’s Rage are multi-person raft rides and allows an entire family to sit in one big tube and enjoy the ride down. However, you only need to have two people in the tube so it was still perfect for us. Triton’s Challenge is a bit different in the respect that you go down the speed slide by yourself. However, there are six side by side lanes which allow you to race friends, family, strangers, etc. My girlfriend and I raced 4 other people, and finished dead last because we started late (cough, cough). But I am happy to say that I did win against her! After Triton, we checked out the 55,000 square foot indoor water park known as Medusa‘s Indoor Waterpark. Since the sun was shining, we didn’t spend too much time in here. We basically just wanted to see how it was for future reference and the next time we go to Mt Olympus Wisconsin Dells. We counted 9 slides, a hot tub, a lazy river, and countless kids play areas. The Bay looked brand new and was as clean as a whistle. We also noticed that Medusa‘s was connected to Treasure Island, which is now named Hotel Rome, which is as convenient as you can get for resort guests. Even though it was rather crowded, I still think it would be better for the winter or a rainy day. Now it was finally onto the rest of Neptune’s. The Tidal Wave, one of the Midwest’s largest wave pools, was our first destination. After 10 minutes of wavy fun, we got out and moved onto some of the slides. MtOlympusPark.com has 37 water slides too choose from. We tried the four magnum body slides the Wipe Out, Kamikaze, Corkscrew and Twister first, then did the double barrel tube slide, and finally it was onto Demon’s Drop and Dragon’s Tail. I don’t know if we hit the right time, or if people were scared of the two single person speed slides, but there was no wait whatsoever. We both did the Demon’s Drop first. It is said to be one of the world’s steepest and fastest water slides and I believe it. We found out that it's an 85-foot drop…straight down. The rush is incredible, but I do have one piece of advice, make sure your swimming suit is tied on tight. We then tried Dragon’s Tail, which wasn’t as drastic, but the 7-story double drop speed slide is nothing to sneeze at. And once again, tie those suits on tight. After these two, we needed a little break so we floated around the Endless River. Although we were a little old for the kid areas, there are a lot of options for the younger crowd at MtOlympusPark.com. There are two main water play areas for children, Huck’s Lagoon and Kiddie City, and if I was 10 years old again, this would a dream come true. Once we were done with Neptune’s and the outdoor water fun, we headed back to the locker and grabbed our towels to dry off. It was about 6 pm, and our fun day was winding down. We walked around the rest of the park to make sure we didn’t miss anything. We saw several gift shops located throughout MtOlympusPark.com, including Great Stuff Gift and Suntammer Gift Shop. There is also an Air Brush stand, caricature shop, and many many other things to see and enjoy while you are there. On our way out, we grabbed a dish of Dippin’ Dots banana split ice cream capping our picture perfect day. They advertise: 4 parks 1 admission…and they couldn’t be more right. MtOlympusPark.com is open to the public and overnight guests Memorial Day to Labor Day. If you plan ahead and purchase tickets online you’ll receive a discount. Group rates are also available. Children 2 and under are FREE. Admission to all four Mt OlympusParks.com is included with any over night stay. Or, you can also pay for the day! Treasure Island Resort which is now named Hotel Rome, has more than 300 guest room and suites to choose. The phone number is 800-800-4997 or 608-254-8180. Also, the Mykonos Village and Camp Resort hosts over 50 spacious and well equipped rooms with full access and admission to the parks. It is located at 1021 Wisconsin Dells Parkway and the phone number is 800-800-4997 or 608-254-8180. One hundred and fifty acres and a $10 million dollar expansion project includes 37 water slides, 15 kiddie rides, 9 go-kart tracks, 7 roller coasters (underground too! ), 2 endless rivers, a wave pool, mini golf, food areas, arcades and shops…what more do you need? Call 1-608-254-2490 or check out the website at MtOlympusPark.com for more information.